It was a pleasure to chat with Cornelius Dönnhoff and Nik Weis, owners of Weingut Dönnhoff in Nahe and Weingut St. Urbans-Hof in Mosel at a recent tasting organised by Kerry Wines. There are commonalities between these two wineries. Both are family owned and highly regarded in their own right. Cornelius and Nik are the latest generation to be in charge of the estates, with Cornelius only taking over in 2000 and Nik back in 1997. Both respect the traditions and are committed to producing top quality wines, just like their fathers and grandfathers. steep south-facing slopes on the banks of the Nahe river. It is warmer, so the wine has riper fruit characters than Mosel’s but still retains the acidity. Cornelius, like his father, likes clean, straightforward wines. He may use cultured yeasts but only the neutral kind whose sole job is to ferment the grape juice rather than enhancing flavours, thus allowing the wine to express itself. Dönnhoff has nine Grand Cru vineyards, and according to Cornelius they have different soil types, ranging from slate at Hermannshöhle and Kreuznacher to volcanic at Felsenberg and loam at Krötenpfuhl. All grapes are vinified the same way but the wines from each site taste different. Before joining the family business, Cornelius had worked in Australia and New Zealand but he realised that because of the differences in climate he couldn’t blindly apply New World techniques at Dönnhoff. He believes his father’s way of working with the vines and grapes is still the best way to express the Nahe terroir. I asked if he would blend the different crus together to make a superblend. His answer was a definite no. The wines have been made as single vineyard wines since his father’s day and they are as good as they can be. By the way, his father is Helmut Dönnhoff, named German Winemaker of the Year in 1999 by the Gault Millau Guide to German Wines. Turning to Nik Weis, the third generation owner. Technically he is not a member of ‘Generation Riesling’, a term used to refer to the young generation of German winemakers under 35 years old (sorry Nik), but he is no doubt their inspiration. Weingut St. Urbans-Hof, because of Nik’s consistently high standards, was admitted as a member of the prestigious VDP (Association of German Prädikat Estates) in 2000. The 32ha of vineyards are located in Mosel and Saar where the soil has several colours of slate—blue, grey and red—that contribute to the distinctive minerality of Mosel Riesling. He only makes Riesling as he firmly believes the terroir of the Mosel-Saar-Ruwer region—cool nights, marginal sunlight, steep slopes, the heat-absorbing slate and the river—is ideally suited to expressing the elegance and finesse of Riesling. I also like his philosophy: "Sweetness belongs to Mosel wine like bubbles belong to Champagne". The combination of residual sugar, crisp acidity and minerality create a harmoniously fruity sensation, and the natural sweetness also extends the ageing potential. He explained to us that natural residual sugar in wine is mainly fructose, which is light and fruity, in contrast to the grape concentrate or süssreserve that is added to dry wine to make lesser sweet wines. Grape concentrate is glucose; it makes wine cloying and heavy rather than light and elegant. Having said that, Nik reckons climate change has allowed German winemakers to start making less-sweet wines. Sugar is necessary to balance the high level of harsh malic acid in a traditional Riesling, but, as the climate warms, the concentration of malic acid decreases so less sugar is needed to balance the wine. We tasted two Spätleses from Leiwener Laurentiuslay vineyard. The 2001 vintage has 50g/l of residual sugar but the 2011 vintage, which was much warmer, has only half as much (25g/l). Both tasted delicious and balanced. With consumers moving towards drier wines, both Nik and Cornelius agreed that climate change is to their advantage as they are now able to make good quality dry Rieslings. The Dönnhoff Hermannshöhle Grosses Gewächs dry Riesling 2012 was a fine example. We tried four Spätleses at the tasting, two each from Nik and Cornelius (vintage 2001 and 2011). They were just fantastic: rich, with a depth of flavour supported by a crisp acidity, resulting in concentrated yet elegant wines. I didn’t like sweet Riesling when I first started tasting wine, but I have come to realise that it was the badly made sweet Rieslings that I didn’t like. Clearly, fructose and glucose really do taste different! 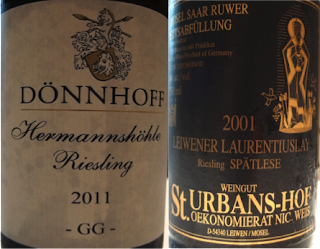 Both Dönnhoff and St. Urbans-Hof are available from Kerry Wines. We had been waiting for this trip for 15 years, after that first bottle of Barolo at our anniversary when we were wine dunces and had no idea what to expect. I won’t say that bottle of Barolo changed my life but it certainly opened my eyes to the world of wine. Our recent holiday in Barolo was an indulgent five days of wine, food and all things good about Italy. The best thing was that this was not a business trip. It was a holiday with my husband only, so no visiting wineries every hour. For me, it was the ideal way to appreciate Barolo and its wine, much better than being shown from winery to winery. We stayed in a small B&B, La Giolitta, in the village of Barolo which only has an 800+ population. The hostess was knowledgeable and arranged for us to visit three great wineries—without anyone knowing that I am from the trade. They were Mascarello Bartolo (fantastic wine, available from BBR in Hong Kong; I had met the owner, Maria Teresa, before, so it was like meeting an old friend), Giuseppe Rinaldi (family owned traditional Barolo, not easy to get hold of), and Gianni Gagliardo (decent wine with a good restaurant, but I would have loved a chat with the winemaker himself). We also dropped by to see Chiara Boschis (Azienda Agricola E. Pira e Figli), a modern Barolo winemaker with vision (wine available from Heritage Wines). And we made a last minute visit to Marchesi di Gresy in Barbaresco, thanks to arrangements kindly made by its distributor, Roddy from Wellspring Wines. The chief winemaker is Kiwi Jeffrey Chilcott. We had an intensive tasting and lively discussion for over two hours—and it could easily have been a lot longer if not for the football match that he had to watch! On our first day, we hiked a loop from Barolo to Novello then Monchiero, Monforte and back to Barolo—18km in total, walking through both cru and lesser vineyard areas, as well as the hazelnut plantations and small remaining patches of indigenous woodland. The soil is so different from plot to plot, and by observing the conditions of the vines I could see why one was a cru vineyard and another not (or at least not suitable for Nebbiolo). The sophisticated thing about this hike was that we didn’t need any packed lunch or energy bars. We could take a break at every village for a snack, gelati and ... of course... vino, and we even saw a parade of old motor bikes on their Sunday outing at Montforte. Better still, we felt guilt-free after the long walk and tucked into an absolutely delicious dinner of brasato al Barolo (beef braised in Barolo) with a bottle of ... uuh ... Barolo and more... for dinner that night. We were there at the end of June, just before the summer crowds, so it was remarkably quiet and everyone was very relaxed. The light at that time of the year is fantastic. We drove around the hilltop villages in the late afternoon from 4:30 to 7pm, capturing the best lighting for photography. Now, back in Hong Kong with all those fond memories of Barolo and two dozen of its wines not available in Hong Kong. It may be a selfish thought but I do hope these Piemonte villages will not become swamped by ‘wine tourists’. We would love to go back to its tranquility.